This short list is a good example of the some of the better expensive toilets you can purchase. Expensive toilets have a lot of customer orientated features that make them desirable at the extra price, while some like the Kohler’s are so good looking that they pay for themselves with the boost in environment. Although it can go either way when deciding on which brand to go with, the only winner in terms of type of toilet is Nature’s Head, for having the best composting toilets in the industry. Luxury features include the programmable nightlight so that you don’t have to burn your eyes switching on the bathroom light at nighttime. This one of a kind design is adorned on a white background portrait toilet so that it looks as good as any high priced painting you can find. The design is meant to be as uncomplicated and accessible as possible, leading to a very fast learning curve. This version doesn’t require any electricity so is great outside, on the road, in the RV or just about anywhere you need a toilet but don’t have access to water or electricity. The first expensive toilet on the list is the popular Neorest, which is also one of the best-selling multifunctional toilets you can buy. Available colors are colonial white, cotton white and Sedona beige. Luxury features include the programmable nightlight so that you don’t have to burn your eyes switching on the bathroom light at nighttime. The completely hands free operation of the Neorest includes an automatic opening and closing lid and hands free automatic flush. You can walk in, use the toilet and walk out all without touching it. Washlet cleansing includes 3 modes as an option, and with the dual-max flushing system buyers will get great power and great efficiency all from one toilet. With an adjustable heated seat and spray, the amount of options available when using this toilet is staggering. It also includes a remote control so that you can fine tune some of the more advanced settings. Dual flush on the low end is 0.9 GPF while the power flush is 1.6 GPF. Since this is a tankless model the dimensions are 26.5 x 15.3 x 21.4 inches and it weighs only 86 pounds. Buyers that want the best item on the list need to look no further than Toto’s Neorest, a top seller that is the envy of all brands. Kohler makes it first show on the list and presents the prettiest toilet available out of all present. The English Trellis design is not only breathtaking, but its very inspiration was taken from English chintz patterns to give it a very unique look. This one of a kind design is adorned on a white background portrait toilet so that it looks as good as any high priced painting you can find. This is the first two piece item on the list, and one of the few two piece toilets that even deserve to be priced this high. Using the Ingenium flushing system buyers can enjoy powerful flushing using the full 1.6 gallons per flush of the product. Dimensions of the toilet come out to 30 x 20.4 x 32.6 inches and it comes in pretty light but durable at 40 pounds. This is close to being the lightest on the list, so will be a big benefit when shipping even though it is a 2 piece toilet. A one year limited warranty seals the deal on this great product, and will satisfy most of the customer base. Buyers that aren’t quite ready to go to the modern toilets will fall in love with the English Trellis Design, and will feel like it is money well spent. The first of two Nature’s head products is this easy to install model that has a molded design. The design is meant to be as uncomplicated and accessible as possible, leading to a very fast learning curve. Because it is so user friendly, just about anyone can use it of all ages without getting lost in the documentation. This is as straightforward a composting toilet as you will ever use, and one of the reasons it is such a high seller. Nature’s Head included the hand crank agitator in the base so that it doesn’t require herculean strength to turn, and also put it at a level where it isn’t uncomfortable for users that can’t bend down for extended periods of time. Accessories included are a 5’ vent hose, 12v power plug and a bottle cap. Dimensions are 19.8 x 20.8 x 20.5 inches with an extremely light weight of 27.2 pounds, so if it needs to be moved to a different room in the house you can carry it. Composting toilets are supposed to be comfortable and easy to use, which is two of the features that Nature’s Head does a good job with. This may not be the best expensive toilet on the list, but it is without a doubt the best composting toilet. This USA made product is not only odorless but compact enough that it can fit in even half bathrooms and be comfortable. That doesn’t take away from its actual seating, as it is elongated and made to be universal for both small and large people. With its waterless operation and stainless steel hardware it is both durable and saves you money on your water bill. This version doesn’t require any electricity so is great outside, on the road, in the RV or just about anywhere you need a toilet but don’t have access to water or electricity. 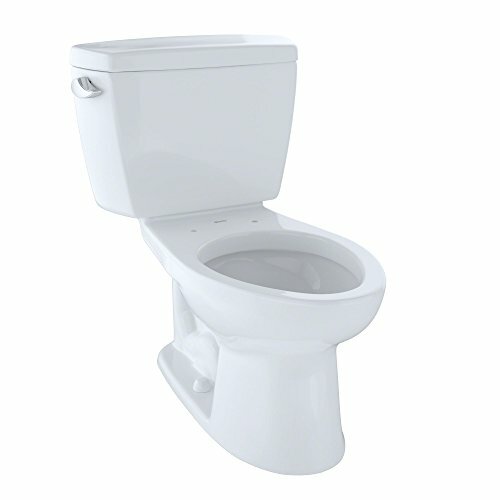 Originally designed for marine use, this is the toughest toilet on the list and will last for years without breaking. Bad odors are handled by the built in low volume air circulation fan that recycles bad air so you aren’t bombarded with bad smells from the holding tank. With dimensions of 22 x 20.5 x 21.7 inches and a light weight of 27.2 pounds, this is just about the most portable self-contained toilet on the list and will work well for any situation. Buyers will be pleased with this purchase and appreciate the rock solid engineering of this top flight product. Last on the list is the rare but well received Peonies and Ivy Revival toilet, a favorite of many customers of Kohler. Inspired by the resurgence of traditional Victorian floral imagery in America, consumers will love the comfort they get just from looking at this toilet. The biscuit colored backdrop is covered with peony blossoms in shades of rose and complimented throughout with green ivy. Little details added throughout the design give it a full look as beautiful as an oil painting. Built with the Ingenium flushing system in mind, this powerful 2 piece toilet destroys waste every time you flush it. There are no clogs, and waste stays down rather than coming back up. It uses the full 1.6 gallons per flush to keep double flushing a thing of the past, and it is backed by the industry standard 1 year limited warranty. It’s gorgeous and is firmly the second prettiest toilet on the list, taking a backseat to another Kohler product. Buyers looking for a pretty but powerful 2 piece toilet are loving this model for all that it offers. It’s pretty clear that the prettiest toilets come from Kohler, it’s just a matter of which one you like best. While the Washlet G500 may not get the attention that the Neorest does, it is still an incredibly good buy and has a lot of similar features. The difference between the two is going to start with the dual flush system, as the Washlet uses less water than the first item on the list. It is the most water efficient toilet on the list, with dual flush options that use 0.9 and 1.28 gallons per flush. It comes in two colors, Sedona beige and cotton. Comfort controls include front and rear warm water washing with adjustable temperature and pressure controls. Get the level of comfort you need rather than getting blasted with icy cold water or water that is too hot for the skin. A unique remote control saves settings for 2 separate users and has an illuminated touchpad so it can operate at night. The toilet is fully automated, and opens/closes as well as flushes all on its own. To complete the package, it has an automatic air deodorizer and a warm air dryer that is very effective rather than being a tacked on feature. The Washlet G500 is a very good toilet and deserves a lot of interest if you’re in the market for an expensive one. Starting with Toto, the most respected of all of the brands, this stands out as the number 1 company in the industry worldwide. They have the market locked down with innovation, available types and recognition. You’ll find more features in a Toto toilet than in any other brand maker on the list. Even if they are sometimes quirky, many users have found their features to be the most customer friendly around. There are a lot of showrooms worldwide that market Toto products, and it gets a lot of interested parties to stop whereas other brands people keep passing by. Most of Toto’s massive sales comes from trying new features long before the others, and they function as a trendsetter of the market. Washlets were created by Toto, and the popularity of bidets is all because of their push into the mainstream. The best bidets that are integrated or standalone come from Toto and Toto alone, with the copycats having only half the functionality. Delivery tends to be fast when you order from the company, and that is due to their many distribution centers worldwide. With more than half of their products being one piece toilets, you’ll have your order at your doorstep in no time. There are bigger companies than Toto that sells toilets, but their toilet divisions as a whole don’t stack up to what Toto offers. The biggest company on the list is probably going to be Kohler, which is so popular that their family is both famous and infamous for personal reasons. But even though they’re the bigger company, keep in mind that the entire company’s focus isn’t just on toilets, but the Kohler brand name. More famous in America than all of the other companies, Kohler has branched out to several different industries and done remarkably well. They are usually right behind Toto when it comes to innovation, and their expensive toilets are just as good if not better than Toto when doing a feature to feature comparison. Although it may be unfair to say, Kohler is more popular than Toto and even serves a bit more as the face in some respects. The Kohler’s even opened up the Michael Kohler Arts Center to help out aspiring artists. It is a small program that gets a lot of press for the good it does for the community and young students. That along with the golf courses, shops, restaurants, company sponsored village events and the hotels are the reason that Kohler tends to keep its name in front more than Toto. Whether the customer prefers their toilet over Toto’s is going to be an interesting decision. Nature’s Head is the most interesting company on the list because of their specialization; composting toilets. While this may not be everyone’s cup of tea when doing a toilet search, it is very much a booming industry, even more so for customers that are on the road a lot. Since they only sell one type of toilet, they oddly have a small advantage since they are the only ones on the list with an expensive composting solution. Even for the companies that offer this option, they can’t match the level of features that Nature’s Head offers, nor the ease of use. Their products are specially molded for ease of use, installation, portability, cleaning and disassembly. It’s the best composting toilet you will ever use, and the company is receiving high reviews from legions of satisfied customers. Composting toilets by nature are given a longer warranty due to their use, and you can expect a minimum of 5 years when purchasing one from the company. Although it isn’t the prettiest type of toilet to look at, it is the most durable toilet on the market and is made for both commercial and residential use. Consumers looking to purchase a composting toilet can easily find whatever they want from this company and skip the rest. Those are the 3 brands on the list, and hopefully that helps you make a better decision on which company might serve your needs better. Remember that the two main ones are going to be Kohler and Toto, with Nature’s Head only serving as an option if you want to purchase a composting toilet. The toilets on this list are expensive for a reason, so let’s get to the reasons why. Starting with the Toto branded toilets, their use of comfort features justify their costs greatly. Toto branded expensive toilets have automatic flushing and automatic opening and closing of the toilet lid. Although the automatic lid may serve as a mere convenience, the automatic flushing is at its best when it is a dual flush system. The toilet will intelligently decide how much water to use in order to get rid of any waste that is in the bowl. Users that are new to dual flush toilets tend to default to using the strongest 1.6 GPF option if it is available. By leaving the decision up to the toilet it allows you to fully take advantage of the water saving features that the system comes embedded with. You’ll enjoy worry free usage and the toilet will handle all of the dirty work. Some Toto products come with a built in bidet, a feature that is mostly reserved for their most expensive models. Without even leaving the toilet seat, you can set the system to turn on bidet functions. Besides the amount of pressure and water type options, there are also options to control the direction of the water. So both men and women will be comfortable with the bidet functions rather than having it at a fixed angle that makes everyone unhappy. And speaking of the remote control, on select models you’ll be able to enjoy a backlit option so that you never have to worry about turning on the light. Combining a backlit remote control with the nightlight on the toilet is such an ingenious option that you will wonder how you lived without it for so long. Other comfort options that fly under the radar is the air deodorizer to keep the toilet and area around the bowl clean and the build in dryer to finish off what the bidet started. These are all optional features, so be sure to check the toilet before purchasing. Kohler rather than focus on the special extras puts its money into simpler things like the design. It’s no secret that the prettiest toilets on the list and in all of the industry come from Kohler. They put more work into their designer toilets than anyone, and that is why they are the most eye catching you’ll ever find. Kohler also offers ‘true’ 1.6 gallons per flush meaning that you will get the full benefit of the industry standard in function rather than just by feature. This is important because a lot of lesser brands claim they use 1.6 gallons per flush but actually use a lot more, and in some cases use a lot less. Kohler’s 1.6 is exactly that, and it doesn’t get more powerful than that for a mainstream toilet under the current standards. With their 1 year limited warranty, it might seems short, but consumers don’t count on what type of customer support they’ll be getting. Kohler has the best customer support out of all the brands, and chances are you’ll be waiting on hold a lot less if you need to call in a Kohler toilet than any other. It is one of their marks of satisfaction that is met every year, and the company lives proudly by it. And if it matters to the consumer, Kohler is the more popular brand. So if you call in a professional to work on it, they will be a lot more satisfied and probably spend less time fixing it. Nature’s Head, the leader in composting toilets, has a laundry list of features that are really incredible considering they only sell one type of toilet. They are great for the middle ground in warranties on the list, offering an awesome 5 years. That’s great especially since these are portable units, and usually portable warranties are about 1 year limited. Durability is also better on this toilet than from any other brand, with full stainless hardware that is built for home and commercial use. This is one toilet that won’t feel the wear and tear of years, and is made to take all kinds of beatings. Installation on a boat is perfectly handled with the angled rear tank, making it perfect for an install on the hull-side of the boat. The toilet has a fully supported liquid tank for optional applications, and it’s translucent so you can see how full the capacity is. Just like one piece toilets have become the rage in the industry, toilets that are easy to clean are in high regard. Nature’s head didn’t forget about that and their molded in toilet seat is not only safe to clean but a complete breeze. For left handed users, the composting handle can be put on either side of the toilet. And whenever it is full, dissembling it takes a couple of minutes due to its painless free construction. The last great feature of these toilets is the top notch order control that is equal to Toto’s air deodorizing toilets. Nature’s Head is the only way to go if you want to purchase the best composting toilet in the industry. That about sums it up for buyers that are in the market for an expensive toilet. Everything you need to know is on the list, so enjoy your purchase. Expensive toilets are a fun way to splurge your money whether you need a new toilet or not.